By Edward L. Sweda, Jr.
Carolina. Seventy-five minutes later, the meeting was adjourned. Before I could attend the meeting, I had to proceed through intense security, with machines provided by Security Detection, empty my pockets and hand over my camera to the RAI staff. The meeting was held again in the company’s main auditorium that seats around 200 people. On the dais were the following representatives of RAI management: Thomas C. Wajnert, the Non-Executive Chairman of the Board, who ran the meeting; Dara Folan, Senior Vice President, Deputy General Counsel and Secretary; Mark Holton, Executive Vice President and General Counsel; Andrew Gilchrist, the Chief Financial Officer and Executive Vice President; and Susan M. Cameron, RAI’s President and Chief Executive Officer. After announcing the rules of conduct for the meeting and potential penalty for violation of the rules, Mr. Wajnert turned to Ms. Cameron for an overview of the company’s business performance for 2014. Curiously, Ms. Cameron began by noting that 2014, while being a “good year” for RAI, “seems a long time ago.” She cited some specifics of RAI’s 2014 performance, including Camel’s high market share and VUSE’s “successful national expansion.” She described RAI’s plans to acquire Lorillard Tobacco Company as the “Right Decision at the Right Time” that is still awaiting regulatory approval by the U.S. Federal Trade Commission. She also called on the U.S. Food and Drug Administration to adopt different regulations for e-cigarettes than for combustible cigarettes. Ms. Cameron made no mention of any of the company’s customers who died during 2014 from smoking-caused diseases. Much of the remainder of the meeting dealt with farm labor issues. Many members of FLOC (the Farm Labor Organizing Committee of the AFL-CIO) were in the audience; they dominated the 30-minute question-and-answer session. While Mr. Wajnert admitted that “bad conditions exist” on tobacco farms in North Carolina, he claimed that “we are working with our growers” to try to remedy those conditions. FLOC representatives cited ongoing violations of child labor laws in the tobacco fields and emphasized that many of the farm workers were doing extremely hard and dangerous work for a minimum wage salary of $7.25 per hour. Another major grievance was the fact that RAI, despite its claims of transparency, continues to refuse to provide FLOC with a list of tobacco growers with which RAI has contracts to provide it the tobacco for its cigarettes. During the question-and-answer session, I asked the following question on ongoing tobacco litigation. “During last month’s RAI First Quarter Earnings Conference Call, Chief Financial Officer and Executive VP Andrew Gilchrist said that ‘a significant portion of our legal budget at this point is being spent on Engle.’ The Engle verdicts in Florida keep on coming. Just last week, a Florida jury returned a verdict of over $6 million for a plaintiff. Meanwhile the Boston Globe last month reported on an upsurge in tobacco product liability lawsuits being filed in Massachusetts – an upsurge that was spurred on by a recent state supreme court ruling that is favorable to plaintiffs. “I have a two-part question. Would you clarify that when Mr. Gilchrist or other executives refer to the company’s legal budget, that it includes not just salaries of company lawyers and payments to local counsel but also the payment of judgments in cases where plaintiff verdicts have survived all appeals? In response, Mr. Holton said that the amount paid in judgments is not included in the “legal budget” category. He also said that the company provides overall amounts for the legal budget, though not broken down by category of cases, to the U.S. Securities and Exchange Commission. Father Michael Crosby presented the proposal and noted that currently RAI is financially benefitting from forced labor. That is a fundamental moral issue that must be addressed, he added. In seconding this resolution, I noted that RAI’s opposition statement that the issue of forced labor is “an issue that should be addressed in a comprehensive manner as part of immigration reforms and policies at the national level” was technically true but amounted to an excuse to pass the buck since there is no likelihood that the current Congress will allow a comprehensive immigration reform bill to be voted upon, given the track record of the House majority in the last Congress. So, in this regard as in so many other aspects of Reynolds American’s business, the status quo continues. The Reynolds American, Inc. 2014 Annual Shareholders Meeting: Change of CEO, change of demeanor, “Transformation” to the status quo. 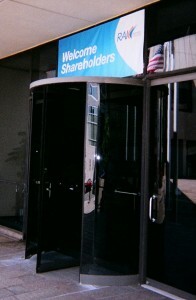 As I entered the Reynolds American Corporate Offices (photo) at 401 North Main Street in Winston-Salem, North Carolina just after 8 A.M. on Thursday, May 8, the company’s “Welcome Shareholders” sign was perched directly above the building’s main entrance. Having cleared through the metal detector, I proceeded to the registration table, where I received my admission ticket to the 2014 Annual Shareholders Meeting of Reynolds American, Inc. (RAI). Since the doors to the meeting room would not be opened until 8:30, I had a few minutes to observe my surroundings inside RAI headquarters. Banners touting Camel, Pall Mall, American Spirit, Grizzly Long Cut, and ZONNIC (the company’s nicotine gum). As I proceeded toward the men’s room, I encountered RAI’s cafeteria, which is named the “Golden Leaf Cafe” and contains black plastic chairs. The back of each of those chairs has a cutout in the shape of a camel. 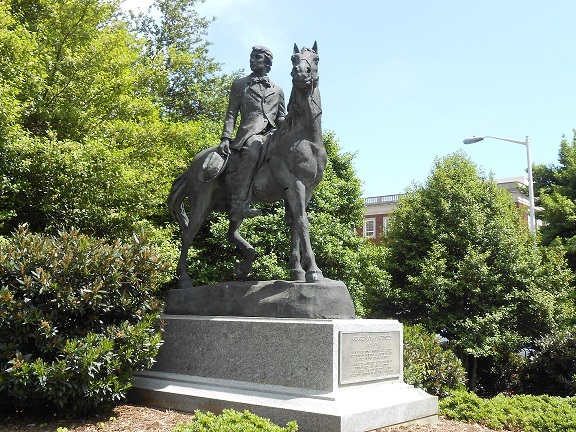 Prominently positioned in the lobby was a large portrait of Richard Joshua Reynolds (whose statue can be found a few blocks south on Main Street — see photo), the company’s founder. I entered the meeting room just after 8:30 and sat in an aisle seat near one of two microphones. After having been personally greeted by several RAI employees, I got a chance to read a two-sided blue handout entitled “Rules of the Annual Meeting.” The closing part of the tenth of the twelve rules caught my attention: “Failure to observe the rules is cause for expulsion from the meeting. Shareholders and their representatives who refuse to leave the meeting upon request could be arrested and charged with criminal trespassing.” I remembered my experience at the 2013 RAI Annual Shareholders Meeting. The 2014 meeting started precisely at 9:00 A.M. and featured the return of Susan Cameron as CEO. Tom Wajnert, the Non-Executive Chairman of th e Board, began by citing his desire for a “productive and orderly meeting” and his opposition to disruptions under the “guise of points of information.” He then turned to Tom Adams, Executive Vice President and Chief Financial Officer, for a report on business. Mr. Adams noted that 2014 marks the tenth anniversary of RAI and that the company had made “much progress since 2004.” Key phrases from his report included: “leading the transformation of the tobacco industry”; “Stronger than ever”; “shareholder return of 27%”; “record profits”; “brand milestones”; and “highest market share for Camel since 1967.” Mr. Adams made no mention of any developments in tobacco litigation over the past decade (see, e.g., https://www.phaionline.org/2010/02/19/all-parties-seek-supreme-court-review-of-racketeering-trial-us-v-philip-morris/ and https://www.phaionline.org/2012/03/26/supreme-court-rejects-key-tobacco-industry-appeal-leaving-massive-liability-with-no-end-in-sight/ ). The premature deaths of millions of the company’s customers and bystanders to the use of the company’s tobacco products were once again excluded from RAI’s business presentation. The Question and Answer session’s allotted time was increased slightly from the 25 minutes at the 2013 meeting to 30 minutes. As it turned out, Mr. Wajnert twice extended the period for shareholders’ questions and everyone who had lined up at the microphones had the opportunity to ask a question. The Q&A session lasted 45 minutes, from 9:40 to 10:25. In response, Mr. Wajnert turned to Martin L. “Mark” Holton III, Executive Vice President, General Counsel and Assistant Secretary. Mr. Holton chose not to address whether RAI had ever informed shareholders of the Law Finance Group’s decision. Instead, he declared that he and the company are “comfortable” with RAI’s litigation position, including at the appellate level, with regard to these cases in Florida. [Just a month later, the U.S. Supreme Court gave RAI another major setback when it refused to consider the company’s appeal of several plaintiff verdicts in the Engle Progeny litigation in Florida. Dr. Sharon Brown, who had been ejected from the 2013 RAI Annual Shareholders Meeting, noted that RAI had resumed cigarette advertising in certain magazines, including Glamour, and expressed additional concern that a Spanish-language version of the company’s “Right Decisions, Right Now” program could help introduce Spanish-speaking youth to RAI’s tobacco products. Many of the questions dealt with farm labor issues, especially the working conditions of workers who toil for companies that supply tobacco to RAI. Mr. Wajnert refused t o answer a direct question as to whether he believed a farm worker’s minimum wage of $7.25 per hour is a fair wage. 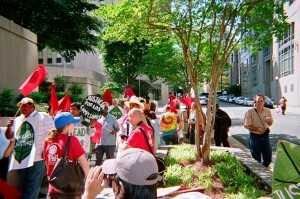 Many supporters of the Farm Labor Organizing Council, AFL-CIO (FLOC) (see http://www.floc.com/wordpress/ ) attended the meeting while others demonstrated outside company headquarters. (photo courtesy of Dr. Sharon Brown). Two shareholder resolutions were defeated. The first, calling for more transparent reporting to shareholders of the company’s lobbying expenditures, received 47.7 million “Yes” votes compared to 393.9 million “No’ votes. The second resolution, calling for an end to virtually all animal testing, received 3.3 million “Yes” votes and 433.8 million “No” votes. Posted in News, Tobacco | Comments Off on The Reynolds American, Inc. 2014 Annual Shareholders Meeting: Change of CEO, change of demeanor, “Transformation” to the status quo. 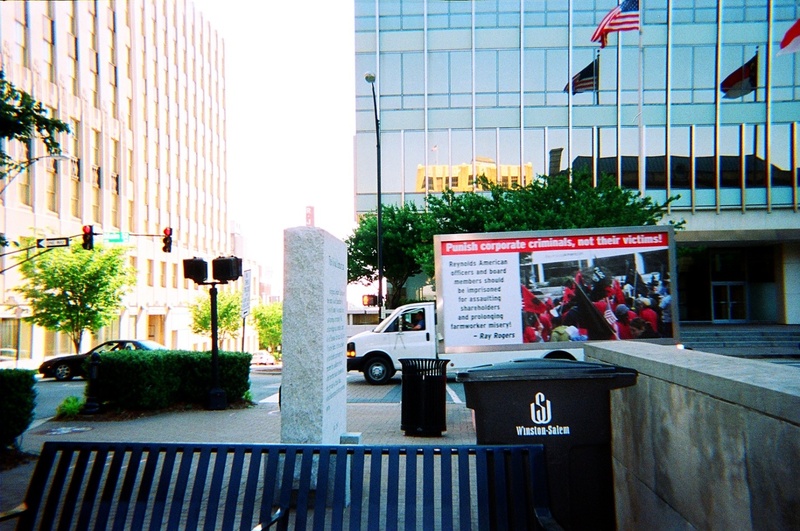 On February 21, 2011, Lorillard Tobacco Company and R.J. Reynolds Tobacco Company filed a complaint against the FDA in the United States District Court for the District of Columbia challenging the composition of the Tobacco Products Scientific Advisory Committee (“TPSAC”) and alleging that TPSAC failed to comply with the Federal Advisory Committee Act (“FACA”). TPSAC was formed immediately following the passage of the Family Smoking Prevention and Tobacco Control Act (“Tobacco Act”). TPSAC was charged with researching the health effects of menthol in cigarettes and reported to the FDA that mentholated cigarettes adversely affected public health, and that their removal from the market would benefit public health. In their complaint, the tobacco companies allege that three members of TPSAC have financial and appearance conflicts of interest stemming from their continued service as paid expert witnesses in anti-tobacco litigation, as well as their continued employment for pharmaceutical companies that manufacture smoking-cessation products. The tobacco companies argue that this creates an unbalanced committee representing only one set of viewpoints that are against smokeless tobacco products and menthol in cigarettes. Lorillard and R.J. Reynolds alleged injuries include disclosure of confidential information to conflicted committee members who could use it to testify for parties adverse to them, that the conflicted members have the ability to shape the TPSAC report to help with their work as expert witnesses, that Lorillard lost 2 billion in shareholder value, and that their procedural right to fair decision making was violated. The companies are seeking declaratory relief that the three committee members violated FACA, as well as an injunction preventing the FDA from receiving or considering any suggestions from TPSAC pending the result of this litigation. On April 29, 2011, the FDA moved to dismiss the suit for lack of subject matter jurisdiction and failure to state a claim. The FDA argued that the tobacco companies lacked standing to challenge the committee’s composition because their alleged injuries were speculative, not traceable to the FDA, and were unlikely to be redressed by the court. Furthermore, the FDA argued that any conflicts of interest are within FDA discretion and are not subject to judicial review. On August 1, 2012, the U.S. District Court for the District of Columbia denied the FDA’s motion in its entirety. The court held that Lorillard and R.J. Reynolds pled sufficient injuries and that the conflicts of interest are justiciable by the court. Due to the limited number of viewpoints regarding tobacco issues and the scientific, rather than political, nature of the issues, the court determined they are equipped with sufficient standards against which it can assess the committee’s objectiveness. With the denial of the FDA’s motion to dismiss, the tobacco companies are able to proceed with their suit. On July 21, 2014, Judge Richard Leon granted Lorillard’s Motion for Summary Judgment to bar the Committee’s menthol report from consideration and orders the agency to reconstitute the Committee. The judge found that the, “the Committee’s findings and recommendations, including reports such as the Menthol Report, are, at a minimum, suspect, and, at worst, untrustworthy.” The FDA has not yet announced whether it would appeal the ruling. The FDA appealed Judge Leon’s ruling to the U.S. Court of Appeals for the DC Circuit which reversed the District Court’s ruling in a January 16, 2016 decision. The Court considered the plaintiff/appellee’s three alleged injuries and found none of them to be imminent enough to confer standing. It, therefore, vacated the District Court’s judgment for lack of standing and dissolved Judge Leon’s injunction preventing the agency from utilizing the Menthol Report issued by the Tobacco Products Scientific Advisory Committee. 2012 Summary by Katelyn Blaney, updated by Mark Gottlieb in 2016. Online Copy of Initial Complaint: http://www.hpm.com/pdf/LORILLARD%20Adv%20Cmte%20-%20Complaint.pdf. The Tobacco Products Scientific Advisory Committee, Menthol Cigarettes and Public Health: Review of the Scientific Evidence and Recommendations, Chapter 8, p. 220 (March, 2011). 2d Amended Complaint at ¶ 2, Lorillard, Inc. v. U.S. Food & Drug Admin., No. 11-440 (RJL), 2012 WL 3542228 (D.D.C. 2012). Lorillard, Inc v. United States Food & Drug Admin., No. 11-440 (RJL), 2012 WL 3542228, at *2 (D.D.C. 2012). Lorillard, No. 11-440 (RJL), 2012 WL 3542228, at *2 (D.D.C. 2012). Lorillard Inc v. United States Food and Drug Administration, Civil Action No. 2011-0440 (D.C. 2014) District Court, District of Columbia. RJ Reynolds Tobacco v. US FOOD AND DRUG ADMIN. 810 F. 3d 827 – Court of Appeals, Dist. of Columbia Circuit 2016. In Commonwealth Brands, the District Court granted partial summary judgment in favor of the tobacco industry, holding both the color restrictions on their advertisements and the ban on safer product claims due to FDA regulation to be unconstitutional violations of the First Amendment. The District Court granted summary judgment in favor of the United States for every other challenged provision holding them to be constitutional. Both parties appealed this judgment to the Sixth Circuit Court of Appeals. On March 29, 2012 a three-judge panel for the Sixth Circuit Court of Appeals upheld every contested provision of the Tobacco Act as constitutional, except for the restriction on the colors used in tobacco advertisements and the ban on continuity programs. Graphic Warning Requirement: In a 2-1 decision, the Court of Appeals held the graphic warning requirement to be constitutional. Arriving at this decision, the court distinguished between the Zauderer and Central Hudson standards of review for infringements on commercial speech, asserting that the former is reserved for disclosure requirements and the latter for prohibitions on speech. The court viewed the graphic warnings as disclosures of factual information about the health risks of tobacco and, as such, evaluated them against Zauderer. The Zauderer standard permits disclosure requirements as an infringement on commercial speech if they are reasonably related to the government’s interest in preventing consumer deception. The court held that the graphic warning requirement was reasonably related to the FDA’s interest in preventing consumers from being mislead about the health risks of tobacco. The court noted the tobacco industry’s history of deceiving consumers about the health risks and addictiveness of tobacco, as well as the ineffectiveness of the current warnings on cigarette packaging, to hold that the graphic warnings are reasonably related to preventing consumer deception. The Court viewed the remaining provisions of the Act as prohibitions on speech and measured them against the Central Hudson standard. In order for restrictions on commercial speech to pass Central Hudson and be deemed permissible under the First Amendment, the government must assert a substantial interest in limiting the speech and the means by which they limit it must be narrowly tailored, meaning the government must use the least restrictive methods to further their interest. Restrictions on marketing “modified risk” tobacco products and the ban on implying tobacco product safety due to FDA regulation: Similar to the graphic warning requirement, the Court of Appeals found the government’s interest in preventing the tobacco industry from making fraudulent claims about the health effects of cigarettes to be substantial enough to satisfy the first prong of Central Hudson. Under the Tobacco Act, in order for tobacco companies to market a product as “modified risk,” the FDA must first determine that the product will actually reduce the harm and risk of tobacco-related disease, taking into account first and second-hand smoke. The court found the pre-approval of “modified risk” health claims to be sufficiently narrowly tailored to further the government’s interest in preventing consumer deception. The Court of Appeals also held that the prohibition of claims that a tobacco product is safer, or less harmful, due to FDA regulation is narrowly tailored to prevent consumer deception. The Appellate Court, reversing the District Court on this count, saw this as a narrow infringement on the tobacco industry’s commercial speech that would otherwise mislead consumers into thinking the FDA endorses cigarettes and tobacco related products. Ban on free samples of tobacco products and the ban on brand-name sponsorship and merchandising for non-tobacco related products: For these provisions of the Tobacco Act, the Court of Appeals found the government’s interest in curbing juvenile tobacco use to be substantial enough to limit the commercial speech of the tobacco industry. The FDA produced considerable evidence showing that these specific marketing techniques reached an overwhelming number of juveniles. Based on this evidence, the Court found the ban on free samples of tobacco products, as well as the ban on any brand-name tobacco sponsorship of anything non-tobacco related, to be narrowly tailored to prevent juvenile tobacco use. Color restrictions in tobacco advertisements and the ban on continuity programs: Although the court decided that the government’s interest in protecting consumer deception was substantial, the court held that color restrictions of tobacco advertisements were too overbroad to further that interest. The court stated that the government could have chosen less restrictive means to limit deceptive advertising, such as prohibiting specific images or phrases, rather than limiting them to black text on a white background. Furthermore, the court held that the tobacco industry’s continuity programs, in which companies offer benefits to existing customers, did not narrowly fit the government’s substantial interest of limiting juvenile tobacco use. The Appellate Court, reversing the District Court, relied on evidence which showed that most existing tobacco users are adults, thus, limiting the continuity programs would not have a material effect on curbing juvenile tobacco use. After the ruling in this case the tobacco industry petitioned for a Writ of Certiorari asking the Supreme Court to review the ruling (American Snuff Co v. United States). The Plaintiff’s Writ of Certiorari was denied on April 22, 2013. Discount Tobacco City & Lottery, Inc., Lorillard Tobacco Company, National Tobacco Company, L.P., R.J. Reynolds Tobacco Company, Commonwealth Brands, Inc., & American Snuff Company, LLC. 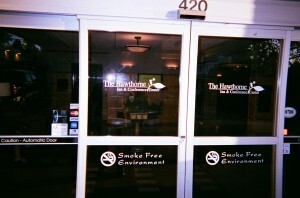 Copy of Initial Complaint: http://www.fdalawblog.net/files/tobacco-lawsuit-v-fda-august-2009.pdf. Disc. Tobacco City & Lottery, Inc. v. United States, 674 F.3d 509, 518 (6th Cir. 2012). The 2013 Reynolds American, Inc. Annual Shareholders Meeting: orders, points of order, “out of order” and ordered out! By Edward L. Sweda, J.D. 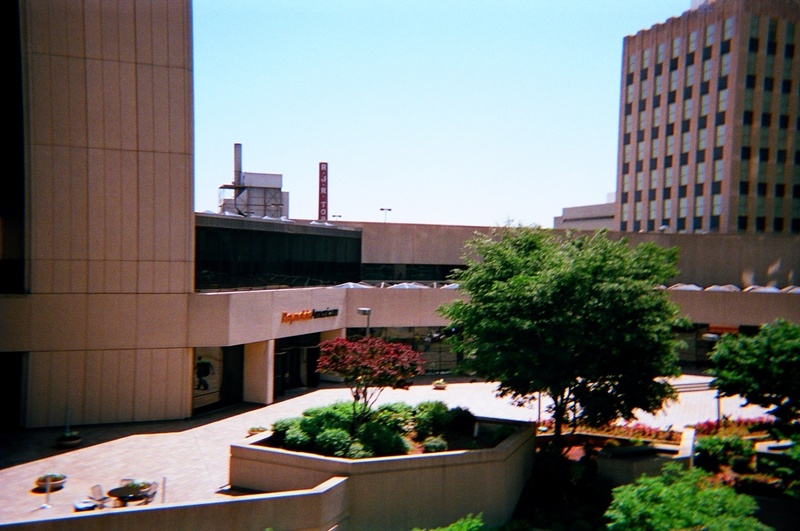 As the hour of 9:00 A.M. approached on May 9, 2013, the date of Reynolds American, Inc.’s (RAI) Annual Shareholders Meeting in Winston-Salem, North Carolina, the atmosphere seemed more contentious than in previous years. 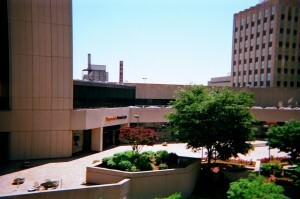 In addition to the tight security that included the wanding of shareholders for anything metallic in their possession, the removal of suit jackets and the emptying of all pockets, Reynolds American management had arranged for the presence of four uniformed Winston-Salem police officers inside the meeting room. That contingent of police supplemented several officers stationed outside the Reynolds American building at 401 North Main Street. After Mr. Wajnert proclaimed from the podium that he would “not tolerate disruptive behavior,” he turned the forum over to RAI President and Chief Executive Officer Daan Delen, who provided a report on the company’s activities in 2012. Delen trumpeted his company’s increasing endeavors in the field of tobacco harm reduction and boasted about RAI’s “innovation,” noting that Camel snus has 80% of the snus market. Delen also touted Zonnic, a nicotine gum, and Vuse, a brand of e-cigarettes whose distribution will be expanded in 2013. 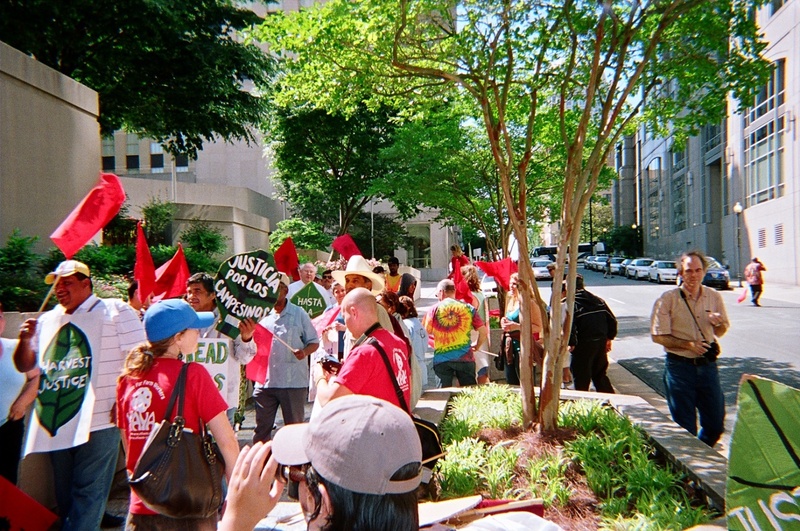 In the presence of many shareholders who are concerned about the deplorable conditions under which migrant farm workers toil in tobacco growing fields, Delen praised the audit of North Carolina farms his company conducted since the 2012 Annual Shareholders Meeting and R.J. Reynolds’ “Good Manufacturing Practices” program, as well as its health and safety training DVDs. 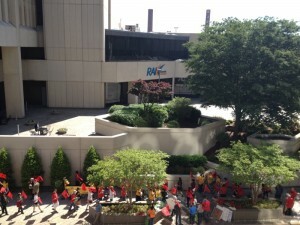 [Members of the Farm Labor Organizing Committee (FLOC) demonstrated outside the building throughout the morning. Finally, Delen, mentioned the increased transparency of the company’s disclosure of its political contributions on its website. This decision had followed the submission by the Province of St. Joseph of the Capuchin Order in Milwaukee and Rev. Michael Crosby, of a proposed shareholder resolution calling on the company to do so. That proposal was withdrawn by the sponsor following RAI’s disclosure. What Mr. Delen did not give shareholders – for the first time in this author’s lengthy history of attending tobacco company annual shareholders meetings – was any comment about any aspect of tobacco litigation. Delen’s silence on this issue came less than two months after the Florida Supreme Court resoundingly rejected the tobacco industry’s legal argument that the way Engle Progeny trials have been conducted since 2009 violates the industry’s due process rights. After a supporter and a seconder of an AFL-CIO-backed shareholder resolution calling for the annual election of board members to replace the current three-year staggered terms made their presentations (the resolution was defeated), the next order of business was the question-and-answer session. In its agenda distributed to attendees, RAI informed the audience that it had allotted all of 25 minutes to consider questions from shareholders. As soon as the meeting’s Q&A session was declared open, Dr. Sharon Brown, a grandmother and a shareholder from Pennsylvania, who was seated second from the aisle where the company’s sole microphone for audience members was situated, stood up and attempted to get to the microphone. Sitting to her right was a male employee of RAI who neither rose to allow Dr. Brown to get by, nor moved his legs sufficiently to allow her by. This author, who had been seated immediately to Dr. Brown’s left and was intending to follow her to the microphone, instead saw Dr. Brown fall to the floor after she attempted to get by the RAI employee. By the time Dr. Brown was able – without any assistance whatsoever from the RAI employee who was at the microphone or from the RAI employee who had been sitting to her right – to get back onto her feet, approximately fifteen people had formed a line leading to the lone microphone. The RAI employee at the microphone ordered Dr. Brown to go to the end of the line. After the allotted 25 minutes had expired and with eleven people still standing in line to ask a question, Mr. Wajnert announced that he would take two final questions. 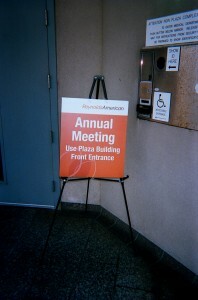 After those two final questions had been asked and answered, Dr. Brown went to the microphone and, noting that the day before she had attended the Philip Morris International Annual Shareholders Meeting in New York City, a meeting where more than an hour was allotted for questions, asked that more time be allowed for shareholders’ questions. The meeting was adjourned several minutes after the ejection of Dr. Sharon Brown. 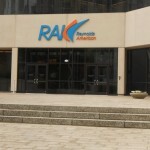 Three key issues were taken up at the 2012 Reynolds American Inc. (RAI) Annual Shareholders Meeting in Winston-Salem, North Carolina on May 3rd. First, the issue drawing the most public attention was the company’s dealings with groups representing farm workers who toil under dangerous conditions and provide the tobacco that brings prosperity to the company and its key executives. At least 20 individuals who attended the meeting dominated the question-and-answer session, urging the company to meet directly with the Farm Labor Organizing Committee (FLOC) after many years of failing to achieve such a meeting. Reynolds American CEO Daniel M. Delen publicly pledged that he would be willing to participate in such a meeting. 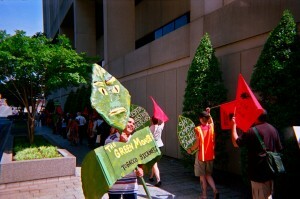 Dozens of protestors outside the building underscored the message of the supporters of the human rights of tobacco farm workers. In addition to commenting on the text of the resolution, Father Michael Crosby denounced RAI’s heavy-handed campaign to oppose California’s Proposition 29, which would raise that state’s cigarette excise tax by $1 per pack and increase taxes on cigars and pipe tobacco from 31.73 percent to 54.89 percent. If passed by the voters, the proposal would raise about $735 million annually, most of which would go toward cancer research. Fr. Crosby also cited the company’s support of the right-wing political organization ALEC, the American Legislative Exchange Council, whose stealth activities have come under increased scrutiny following public disclosures of ALEC’s drafting of and advocacy for Florida “Stand Your Ground” law and several states’ anti-immigrant legislation. The shareholder resolution was defeated, according to the preliminary tally reported at the meeting, with 6.4 million shares in favor, 418 million shares opposed and 6.3 shares abstaining. The third key issue was litigation, specifically RAI’s “litigation progress” – or lack thereof – in dealing with the Engle Progeny cases in Florida. During the business presentation by Mr. Delen, RAI’s CEO stated that, since 2010, RAI had been “successful” in two-thirds of the Engle Progeny trials. Such “successes” included not only defense verdicts but also – for the first time publicy stated in this author’s memory at any tobacco company’s shareholders meeting – mistrials (such as when a jury is deadlocked without being able to reach a verdict). In 2009, a Florida jury awarded $3.3 million in compensatory damages and $25 million in punitive damages against Reynolds American in a case involving the death of Benny Ray Martin, the husband of Mathilde Martin. Her case is one of thousands of “Engle Progeny” lawsuits in Florida, cases that followed the landmark 2006 ruling by the Florida Supreme court in Engle v. Liggett Group, Inc., 945 So. 2d 1246 (Fla. 2006). After losing on appeal at every stage in the Florida’s state court system, RAI filed a petition for certiorari with the Supreme Court of the United States. In arguing in December 2011 that its petition for a writ of certiorari should be granted, Reynolds’ attorneys (Paul D. Clement of Bancroft PLLC, Gregory G. Katsas of Jones Day and Eric E. Murphy of Jones Day) claimed that in “their conduct of Engle progeny litigation, the Florida state courts are engaged in serial due-process violations that threaten the defendants with literally billions of dollars of liability.” (emphasis added) Moreover, “the massive liability imposed on the Engle defendants – which currently stands at over $375 million in adverse judgments – will… steadily increase as Engle progeny trials continue with no end in sight.” (emphasis added). Mr. Holton notably did not address the doomsday scenario outlined by his company’s attorneys who filed the writ for certiorari. So, in a span of just five months, this RAI shareholder received from the company diametrically polar opposite predictions concerning the future of tobacco litigation, depending on which side of the Reynolds American corporate mouth was talking. 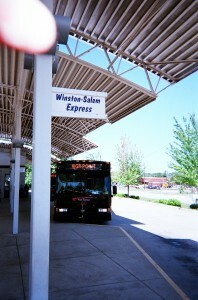 WINSTON-SALEM, N.C. — On Thursday, May 5, 2011, I made my way to this historic city via the Winston-Salem Express. Friday morning at 9:00 A.M. sharp was the scheduled start of the 2011 Annual Meeting of Shareholders of tobacco giant Reynolds American, Inc. (RAI). The 2011 Annual Shareholders Meeting of Reynolds American, Inc. (RAI) took place on a day when Daniel Delen, who took over as chief executive and president of the company in March, made what was billed as a major pronouncement. 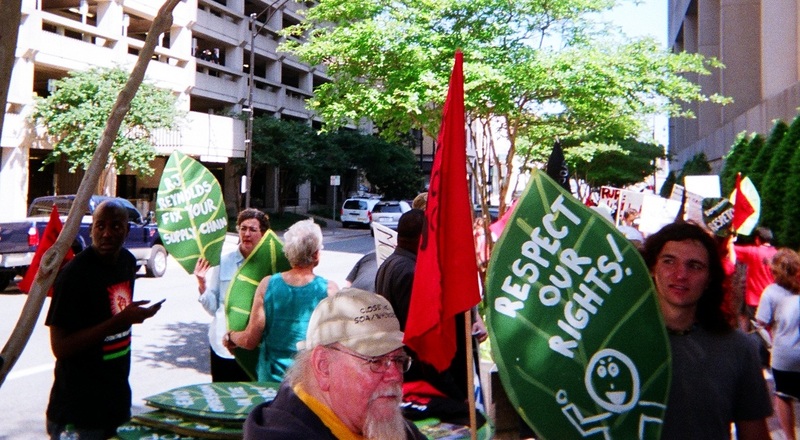 Noting the findings of a major study entitled “A State of Fear: Human Rights Abuses in North Carolina’s Tobacco Industry,” by Oxfam America and the Farm Labor Organizing Committee, AFL-CIO (FLOC) of the conditions under which tobacco farm workers in North Carolina do their work in the fields, Mr. Delen proposed that a multi-party council be formed to address these labor issues. Additionally, he publicly pledged to use an independent, third-party monitor to analyze the issue of the conditions under which these workers labor at U.S.-based farms that supply essential product to RAI. Mr. Delen’s promises, which will be put to the test in the upcoming weeks and months, stand in contrast to the public position of previous C.E.O. Susan Ivey, who insisted that RAI had no responsibility to take steps to improve working conditions of farm workers who labor under often unsafe working conditions on farms run by Reynolds’ suppliers. However, on the litigation front, RAI management is as rigid as ever. During the question and answer session, to which RAI allotted all of 25 minutes – fully ten minutes more than at the 2010 Annual Shareholders Meeting – I addressed the major legal problems that R.J. Reynolds Tobacco Co. is facing in the Engle Progeny litigation in Florida. Shareholders are allowed up to two minutes to ask a question (a video board at the front of the meeting room featured a large numeric countdown from “2:00” once a shareholder began to speak); I mentioned that since February 2009, there have been 43 Engle Progeny trials that have reached a verdict and that 30 out of those 43 have been plaintiff verdicts. Just a week before the shareholders meeting, a jury in Jacksonville, where a disproportionately large number of the remaining 8,000 to 9,000 lawsuits yet to be tried are located, hit RAI with a $17 million punitive damages award. Furthermore, the company is appealing its multi-million dollar loss in the Martin case and must prevail in an uphill climb to convince the Florida Supreme Court to reverse its own 2006 landmark ruling in the Engle class-action case. I concluded my remarks by asking whether the company, for the good of its shareholders, would move away from its current policy of refusing to settle these Engle Progeny cases. Two important shareholder resolutions called on the company to address concerns regarding tobacco flavoring and to create human rights protocols for the company and its suppliers. 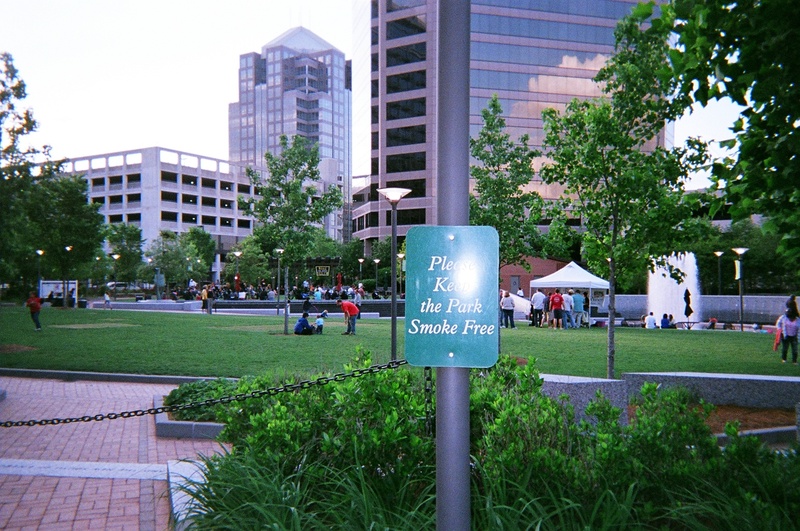 Noting that the U.S. Food and Drug Administration has found that the smoking of flavored cigarettes is more popular among youth than among adults, the proponents offered this resolution “that, because youth initiation of tobacco products is influenced by the flavoring, shareholders request that, within six months of Reynolds American Inc.’s annual meeting, the Board of Directors move to ensure that RAI stops the production of any of its tobacco products with such flavoring added, as well as their distribution and their marketing, unless and until it can be proven by independent and evidence-based research that such added flavors do not contribute to youth initiation of tobacco use.” Father Michael Crosby introduced the resolution while Anne Morrow Donley of Virginia seconded it (their remarks were limited to two minutes each). A major threat to the health of tobacco farm workers is Green Tobacco Sickness (GTS), which occurs when the skin absorbs nicotine after touching the tobacco plants. Another significant concern regarding Reynolds American, Inc. is that it receives leaf from Malawi, a country in which child labor in tobacco fields takes place. Father Crosby introduced the resolution while I seconded it. RAI’s opposition to this resolution attempted to pass off any responsibility on this issue onto the already overburdened regulatory apparatus of state and federal governments in the United States. Management also claimed that “RAI and its operating companies strive to comply with all laws and regulations.” In my allotted two minutes, I noted that, as an individual, I do not “strive to comply with laws, I comply with laws.” I noted that, while there would be serious consequences for me if I failed to comply with laws, there seem to be no consequences for RAI or its suppliers failing to comply with basic laws and regulations governing worker health and safety. 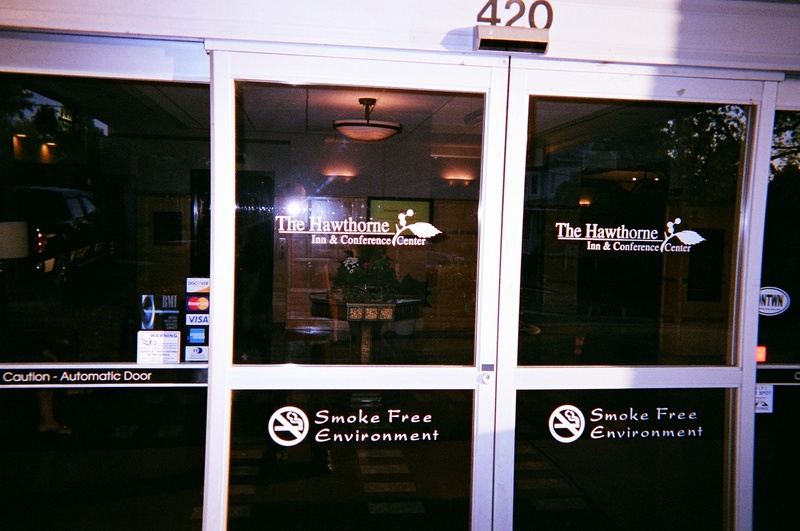 I was encouraged to see signs such as this one on the front door of the hotel in which I was staying in Winston-Salem. 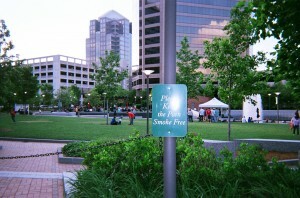 As mentioned above, the shareholders meeting was entirely smoke-free. 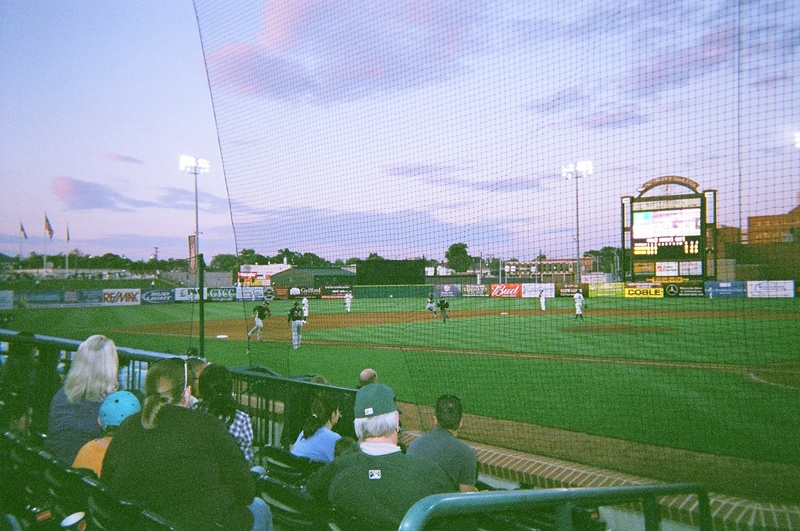 To cap off my trip to North Carolina, on Friday night I attended a South Atlantic League baseball game between the Hickory Crawdads and the host Greensboro Grasshoppers. 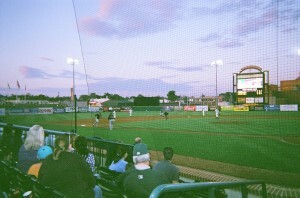 The game, won by Hickory 7-2, was played at NewBridge Bank Park, a smoke-free park. NEW RULES REGARDING ADMITTANCE TO THE MEETING. However, that letter, which was part of the company’s proxy materials, was not mailed to shareholders unless the shareholder specifically requested that the material be sent. Unfortunately, both I and shareholder Anne Morrow Donley of Virginia GASP missed the deadline for requesting an admission ticket by one day. Strictly adhering to the terms of this new rule, RAI’s Assistant Secretary, Dean E. Tsipis, informed me that the company was “unable” to fulfill my April 29, 2010 request for an admission ticket. “Unwilling” would have been a more accurate adjective. Similarly, a new attendance rule by RAI kept out Keith T. Barber, a reporter for the Greensboro, North Carolina-based “Yes Weekly.” On April 28, 2010, RAI “announced” – via a release via PR Newswire but not by directly contacting local reporters – that members of the media had to request an admittance ticket by April 30, 2010. 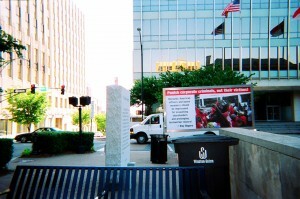 Mr. Barber, who arrived at the meeting on May 7, 2010, was barred from the meeting. 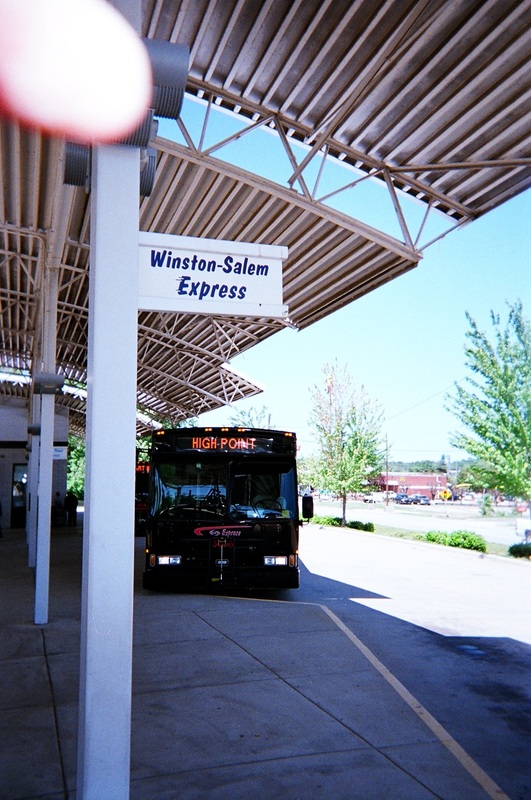 Winston-Salem’s taxpayers financially supported the heavy presence by the Winston-Salem Police Department (WSPD) at the Reynolds American meeting. Shortly after the 9:00 A.M. start of the meeting, there were four police officers standing in front of the building while four marked police cruisers were parked near the building’s main entrance. At the side of the building were another two parked police cruisers. 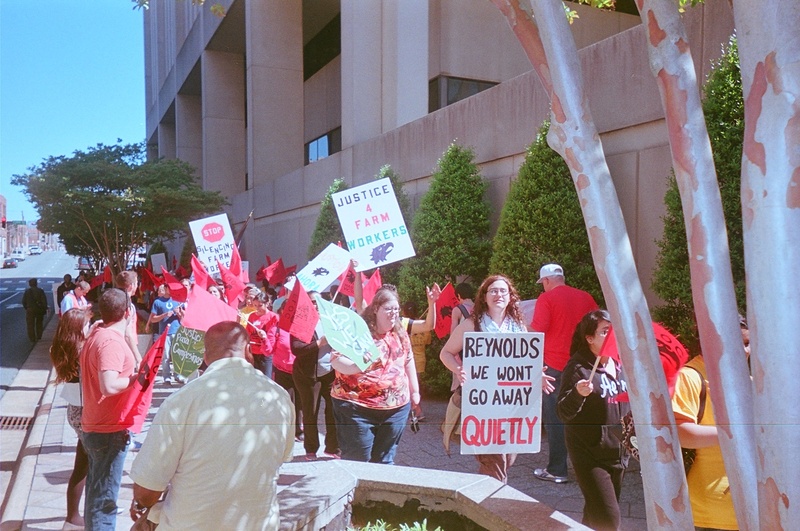 As the FLOC demonstration was winding down at about 11:25 A.M., one of the WSPD officers told organizers of the demonstration that Reynolds management would like the demonstrators to leave the front of the building by 11:30 A.M. The major controversy at the RAI meeting was management’s unwillingness to meet with members of FLOC (Farm Labor Organizing Committee), AFL-CIO. (See this for details of FLOC’s campaign regarding Reynolds American. FLOC has also described desperate conditions in North Carolina’s tobacco fields, noting that nine workers have recently died in the fields, most due to heat stroke. Not surprisingly, RAI management opposed the resolution calling on it to provide its customers with truthful information. It claimed that “Our Guiding principles and Beliefs” are sufficient. The resolution received less than 2 percent of the shares voted and, thus, will not be eligible to be refiled for next year’s Shareholders Meeting. RAI management opposed this resolution as well, claiming that respecting universally recognized human rights “is one of the foundations of how we conduct our businesses.” Nonetheless, RAI opposed the resolution, stating that “we do not believe it is within our sphere of influence to assume the regulatory and enforcement role of the federal, state and local governments” in the United States. Of course, the resolution had not called on the company to assume those roles; rather, the “truly independent monitoring” would be key to ensuring that the suppliers were adhering to these laws in countries such as Malawi. The proponents noted that “RAI cannot dismiss the above problems by saying its suppliers ‘report’ they comply with codes covering farm workers’ basic rights and that no forced child labor takes place in tobacco fields supplying RAI product.” If RAI feels it cannot enforce these basic codes, it could stop doing business with suppliers that abuse workers’ human rights. It has never done so.